This past weekend I traveled from my home near Boulder, Colorado to the Colorado River in Boulder Canyon, on the Nevada / Arizona border just below Hoover Dam. My cousin Tracy, an expert at cramming what normal people consider “vacations” into short weekends, planned this glorious outing a couple months back, and I happily accepted her invitation to come along! There were 9 of us altogether: family and friends from California, Nevada and Colorado. 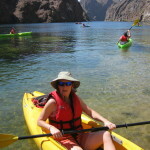 Tracy arranged our trip with Desert Adventures, who did a wonderful job transporting and orienting us for our journey. We split up into 2 canoes and 5 1-person kayaks. The canoes held most of our gear and thankfully none tipped over! Here’s a brief description of our journey, followed by a galleria of photos. 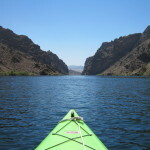 Day 1, Saturday: gathered at 8:15 just east of Boulder City, launched around 9, then traveled 4 miles down-river. 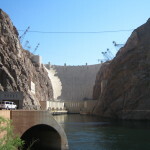 The launch point is just below the Hoover Dam. We explored the Sauna Cave, hot springs in Gold Strike Canyon and also some spraying in to the river, etc. Reaching where we planned to camp around 1, we ate, set up camp, walked to a hot springs with waterfall just up the canyon, ate, hung out, ate, paddled, made s’mores, with most of us going to bed before the sun went down. Day 2, Sunday: 7 miles. We awoke to find a mouse had drowned in a cup of water we’d left sitting out. We ate (but not the mouse), packed up and set out (before 7 I think it was), paddled and enjoyed the water until about 9:30, had brunch, paddled some more, some of us took a swim along the way, the wind kicked up in late morning and there was a hellish mile-or-so long slog heading south into strong winds from the south until our take-out point at Willow Beach, where we then ate lunch, napped, lounged etc. until our pick-up at 3. Something about being on the water makes you want to eat all the time. Which we did. Thank you Tracy for packing such good food for us all, we really appreciated it!! Hot and Cold: The water in the river is 55 degrees Fahrenheit, which is pretty cold to bare skin. In contrast, there are hot springs flowing in to the river in numerous places, some of them pretty scalding, and the air temperature was above 90 F both afternoons. I don’t know if it’s always like this, but it got windy both days near noon, from the south, the direction the river was taking us. I think it canceled the current and then some. This made paddling downstream feel like paddling up hill. They tell you to pee in the water instead of on land. It is hard to feel comfortable doing this after years of conditioning. P.S. Aside from the afternoon wind, this trip was delightful!